Recruitics is a B2B SaaS platform used by companies that advertise jobs to increase ROI. Where should I spend my advertising budget? Poor data reporting and long loading states that are unable to keep up with the volume. Outdated UI patterns that were incompatible current browsers. 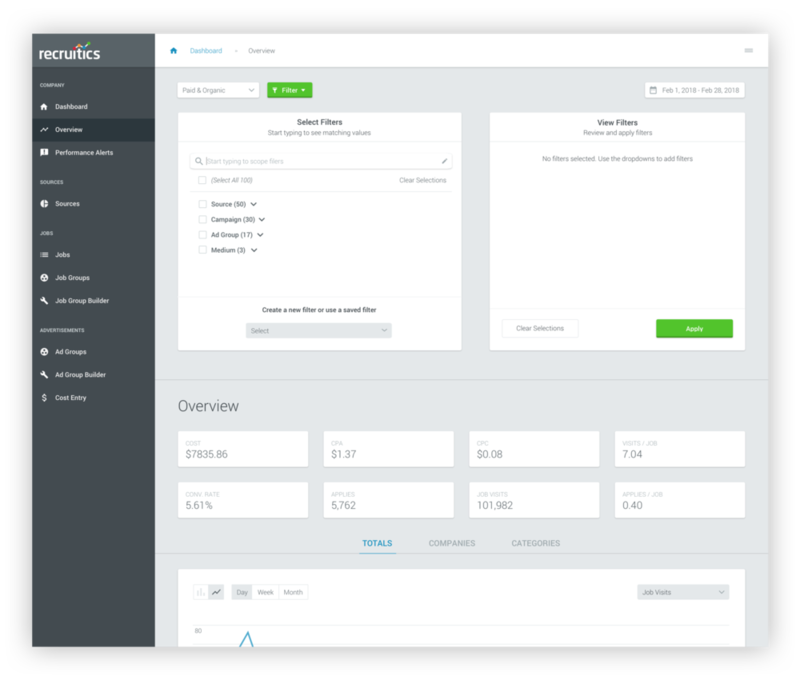 As a result, the team came out with a completely redesigned upgrade called Analytics. Although the current design solved some of the web compatibility issues, the data reporting had missing features such as advanced filters. My role was to fix those issues by designing a new and improved filter tool. I started the user research by interviewing the various account managers. Although they were the same roles, their work varied depending on the type of clients. For instance, an account manager who worked with corporations were different than those were worked with sharing economy tech companies. Once I was done with initial interviews, I did a competitor analysis of filter designs. My two sources of inspiration were the filters in Zappos and Google Analytics. In Zappos, you are able to view your filter selections in a separate section than your filter options. The feature addresses the problem of account managers who need to select numerous filters at a time. In Google Analytics, there was a search bar you can use to scope various filter options. This helps users find specific filters from a long list instead of having to scroll. In Google Analytics, there is a search bar you can use to scope various filter options. This helps users find specific filters from a long list instead of having to scroll. Based on my research. I came up with two prototypes that addressed the user needs in two different ways. To mitigate sequential bias, Some users saw the multiple search option first, and vice versa. Both of the prototypes yielded a head-head completion rate, with 91% for multi-search and 90% for the single search. The users had the most issues with the saved filters option for both prototypes. As a result, we decided to move the save functionality to a later release. The user’s preferences were determined by similar to search patterns they’ve seen before. I got comments such as “this reminds me of Microsoft Excel” or “This looks similar to the search on insights”. However, they had different mental models of what reminded them of what. Some thought the multi-search looked similar to insights and vice versa. There were no strong preferences for either version, both of them received strong feedback. The product team eventually chose the single search option because of better technical capability and the design was more scalable to accommodate future categories. I collaborated closely with the engineers to implement my design.